OC Mom Activities: How to Spend $100 a Week on Groceries for a Family of Four! 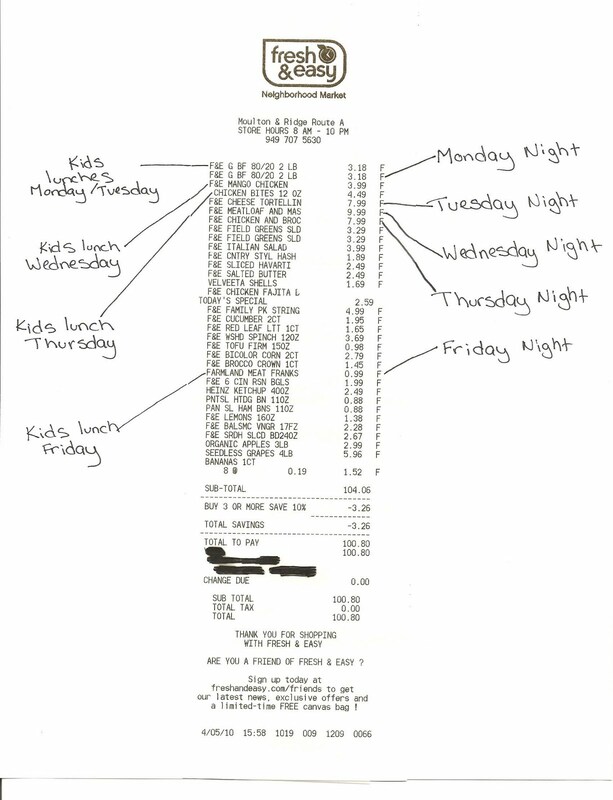 How to Spend $100 a Week on Groceries for a Family of Four! I spend $100/ a week on groceries for our family of four (yes, that includes lunches for the kids at school)! It all started a few months ago when I got tired of how high our grocery bill was getting with multiple "quick stops" in to the local grocery store to pick up things here and there. It had to stop. I'm not sure if my biggest motivation was saving money or if it was just being organized for the week so we weren't scrounging around for last minute dinners. An added side bonus is my husband now cooks most of the dinners! Don't believe me? Well, as you'll see below the dinners are easy, fast, healthy and super easy on the budget. So you're probably wondering what my trick is? Well, once a week I grab my reusable grocery bags and head to Fresh & Easy. I buy 3-4 of their prepared dinners, tons of veggies for side dishes, super yummy packaged salads for my lunches and plenty of snacks to add to the kids lunches. And yes... all this for $100 a week. Don't believe me? Check out my recent receipt below. I pointed out some of the key dinners & school lunch main dishes. One of the things I love the most is the prepared family size dinners, they take about 10 minutes to cook (oven or microwave) and when paired with salad or other veggies, it's a complete meal. Homemade hamburgers (loaded with onions, spinach & garlic) are great main courses for the kids school lunches. Would you love to only spend $100/week on groceries? Try out our plan for one week... and I'm pretty sure you'll be hooked too! Be sure to come back and comment about your experience! i love fresh and easy! I need to shop there more! Gr8 job! Hi-5! LOVE this place. Thanx 4 the tip! Sweet lady told me about the COUPONS. Don't 4get 'em! O.k., now that out youngest is out of diapers, I need to try Fresh & Easy. I always used the excuse that I couldn't "one stop shop" there since I needed diapers - no more! Woo hoo! It's amazing what a little creativity and shrewd thinking can do for the budget. We use tons of coupons and it makes a huge difference. Free Planet Earth Episode Download on iTunes!